Canada’s rising jumping stars gained invaluable team experience and achieved impressive results during the Children & Junior Nations Cup competition on June 2, 2018 at the CSIO 5* Odlum Brown BC Open in Langley, BC. The Children’s course, set at a height of 1.20m, featured 12 jumps and 14 efforts in a time allowed of 85 seconds. Following FEI senior Nations’ Cup rules, teams of four athletes challenged the course twice, with the ability to drop the lowest score in each round, and the goal of achieving the lowest two-round total. Canada finished the first round tied with the United States on a team total of four faults after applying the drop score. Mexico finished round one on 12 faults. The trailblazer for both rounds, Eric Krawitt, 13, proved to have a standout day, achieving foot-perfect performances across both courses aboard Wellington, a nine-year-old Dutch Warmblood gelding owned by A.E.S Equestrian Inc.
Second on course for Canada in both rounds was Chernoff, 13, who was excited to make her team debut at Thunderbird, having named the venue as her favourite competition. Riding Filia Van Den Bisschop (Vigo d’Arsouilles x Lys de Darmen), a 13-year-old Belgian Warmblood mare owned by Peeters Paul and Alfons, Chernoff finished well under the time in both rounds, and had her best performance of the day in round one, where she lowered just one rail at jump four for four faults. Deacon, 13, was next riding Corona OS, an 11-year-old Dutch Warmblood gelding sired by Urame and owned by Carly Stevens. After a solid round one performance that proved clear up until the very last fence, Deacon returned for round two to lower just one rail and come in slightly over the time allowed for a total of five faults. Rounding out the team’s performance was Canada’s youngest competitor, Stephenson, 11, who followed Eric Krawitt’s lead by laying down back-to-back clear performances aboard Chaccana (Chacco Blue x Kannan), Tomboy Farms’ 11-year-old Oldenburg mare. Ultimately, the Children’s Team earned their second place on a team total of nine faults, with just one fault separating them from the winning team from the United States. Mexico followed in third on a total of 12 faults. The CSIOJ* Junior Nations’ Cup was up next, with Anya Bereznicki of Calgary, AB, Mary Jones of Vancouver, BC, Austin Krawitt of Okotoks, AB and Carly Stevens of Foothills, AB riding for the maple leaf. The Junior course, set at a height of 1.40m, was nearly identical to the Children’s course, with the exception of an oxer at jump 12 being swapped for the difficult open water, resulting in a slightly looser time allowed of 88 seconds. Like the Children’s Team, the Junior athletes were up against teams from the United States and Mexico. Following the first round, the teams were in a three-way tie on four faults. Bereznicki, 14, who was representing Canada for the third time in her young career – having earned Team and Individual Silver Medals in the Children’s division at the 2017 FEI North American Junior and Young Rider Championships (NAJYRC) – was the first to re-enter the ring for round two. Riding her NAJYRC partner, Diazella (Diamant de Semilly x Candillo), a 10-year-old Holsteiner mare, Bereznicki managed to repeat her foot-perfect first round performance, resulting in her second zero on the board for Canada. Austin Krawitt – the 15-year-old older brother of Children’s Team member, Eric Krawitt, was next. Having achieved a clear in round one, Austin had a light rub on the middle element of the triple combination for four faults in the second round aboard High Jack (Jack of Diamonds x Cavalier Royale), a 10-year-old Irish Sport Horse gelding owned by A.E.S. Equestrian Inc.
Canada’s third rider was Bereznicki’s NAJYRC 2017 silver medalist teammate, Stevens, 15. Although Stevens encountered challenges at the open water in both rounds to incur jumping and time faults, she left every rail in the cups in round two aboard Dento (Cardento x Concorde), a 10-year-old Dutch Warmblood gelding owned by Grant Stevens. Jones, 17, had consistent performances in each round, lowering only the bogey fence of the day – the middle element of the triple combination at 5b – in each round for four faults apiece. She was aboard her long-time partner she calls “the little horse that could”, Cartoon (Carinjo x Lacapo), a 12-year-old Holsteiner gelding that measures 15.3hh. At the end of the second round, Canada’s third place finish came on a two-round total of 12 faults. The United States and Mexico kept to their first round scores of four faults, resulting in a jump-off to break the tie. Each country sent one rider into the ring to challenge a shortened course that would see the fastest rider with the least amount of faults win gold for their country. Although both riders left all the rails in the cups, ultimately, American Coco Faith brought home the win for her team after crossing the timers one second faster than Mexican rider, Eduardo Riba Chico. Underhill also spoke to the dynamic and well-rounded experience Canada’s up-and-coming athletes were treated to throughout the week at the CSIO 5* Odlum Brown BC Open in order to help foster their growth. “We were able to start the week with a continuation of our Youth Education Seminar (YES) Series,” said Underhill, explaining that the Thunderbird edition of YES saw Dr. David Paton, FEI Veterinarian, speak to the athletes about correct protocol for jogging and additional information pertaining to FEI policies, while FEI Steward, Fran McAvity, provided invaluable insight on the role of a steward, and other important knowledge youth athletes need to have before moving into FEI competition. The youth athletes also received the special opportunity to attend a course walk with Canadian Olympian and senior nations’ cup team member, Tiffany Foster. 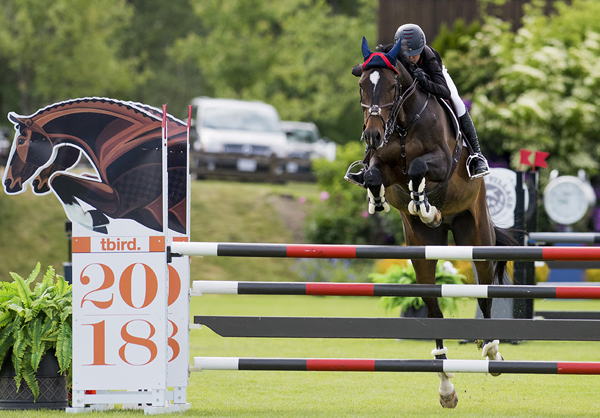 For more information and full results from the CSIO 5* Odlum Brown BC Open, visit www.tbird.ca.